With a coach like Gerard Kemkers, who needs competition? By now you may have heard of poor speedskater Sven Kramer of Holland, whose gold medal was torpedoed by his own coach, Kemkers. Kemkers, who admitted later that he had been momentarily distracted, nonetheless barked out an order to his skater late in his 10K meter race to change lanes, a gaffe that caused an illegal move by Kramer and thus disqualifying the young man. Kemkers, distraught, tried to comfort Kramer immediately after the race but the skater angrily brushed him off, making wild arm gestures and slamming his glasses to the ice. Kemkers is lucky that Kramer didn't blend him into Hollandaise sauce. "I was on my way to making the right decision," Kramer said later. "Right before the corner, I changed my decision. I changed my decision on the advice of my [coach]." It's been said that the only thing that could survive a nuclear holocaust is the cockroach. That, and the Warren Consolidated Schools. I suspect that Warren Con, as it's so aptly called for short, would steadfastly refuse to shutter its doors even as nuclear winter rained down and the air was as toxic as a Rush Limbaugh/Glenn Beck lunch. 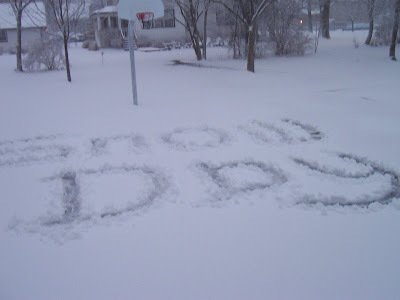 Over 420 school districts said "forget it" this morning, as a winter storm bulled its way through the metro Detroit area overnight and throughout much of the day today. Big districts, little districts, and the ones in between--they all decided to live to teach another day. They've pulled this nonsense before, and as you've guessed by now I have a child in that district. I wonder what Bill Hart did with my coffee mug. All this talk of Detroit politics, in the glow of the special mayoral election held on Tuesday because of Kwame Kilpatrick's ousting, got me to thinking of other disgraced high profile types the city has known. I sat across from Police Chief William Hart in October, 1989, and the man seemed awfully stiff, I recall. Hart was the first African-American police chief in Detroit, and I was getting ready to interview him on a local cable TV show I hosted called Innerview. Note the play on words. Boy, I was clever back in the day! The show was biographical, and the cameras were all trained on the guest. We did it in an artsy-fartsy way, a format I copycatted from an old A&E show, the title of which escapes me. It was a scene that’s been played out over and over again: beleaguered politico surrounded by wife and family, as he delivers his news of succumbing. It could have been a resignation in shame, a concession speech, a clumsy explanation for some sort of misdeed. Regardless, there the family is, providing support, no matter how false (in some instances). I wonder what life lesson soon-to-be former Indiana Senator Evan Bayh has just taught his kids, who were flanking him the other day as he threw his hands up and gave up on Congress. If the going gets tough, kids, then just quit. Don’t have any convictions, my children—just get out of the kitchen at the first sign of warmth. If Evan Bayh was so sick of the gridlock in Washington—and I don’t blame him for being frustrated—then he should have sucked it up and stayed and tried to be part of a solution. Where is America going that we need so many directions? GPS systems/devices are all the rage. Smart-as-whips gizmos that tell us when to turn left or right, how far it is to our destination, and even suggesting possible shortcuts. It's becoming a status symbol of the 21st century---whether or not you have one of these electronic navigators in your vehicle. I've seen grown men bursting at the seams about their GPS systems. Where is everyone going, that they don't know how to get there? I don't know about you, but I pretty much always know where everything is, when it comes to where I venture on a normal basis. The Target. The mall. The grocery store. The ballpark, on occasion. My mother's house. The movie theater. McDonald's. The local Thai joints. Suzy's Party Store. CVS. The race track, on occasion. Sanders is coming back, after all. No, Lions fans, I don't mean Barry. Sanders Candy is being reanimated, thanks to the help of Morley Brands. "Fundraising really took a hit in the 1980s and '90s," Morley Brands President Ron Rapson tells CNNMoney.comabout the fetish schools, Boy Scout troops, and other organizations had for hawking Morley candies to beleaguered friends and relatives. "It got to the point where it wasn't really a money maker. So we decided to go back to what we did best---making chocolates. "And we hooked up with another great company---Sanders," Rapson adds. Fred Sanders' company hit the market in Detroit in 1875, offering everything from candy to milk shakes to ice cream. In its heyday---from the 1950s through the '70s, you could hardly drive more than a few miles in metro Detroit without running into a joint that sold Sanders products, or that had a genuine soda jerk emphasizing Sanders goodies. As a child/youngster/youth, if there was anything better than finding out school was canceled, then it was most likely something you'll never own up to publicly. There might be a "snow day" on Wednesday---and not just for the kids. Some of the big people might get the day off, too. It's nothing like what's been going on along the Mid-Atlantic Seaboard, which has been pelted relentlessly since late last week, but the folks who should know are calling for anywhere between six and ten inches of the white stuff to cover us between Tuesday and Wednesday. You remember the moment, I'm sure---the precise moment when you heard that school was called off for that day. And to think that most of the action took place on a sound stage so small that the camera barely had to pan left or right during any given episode.